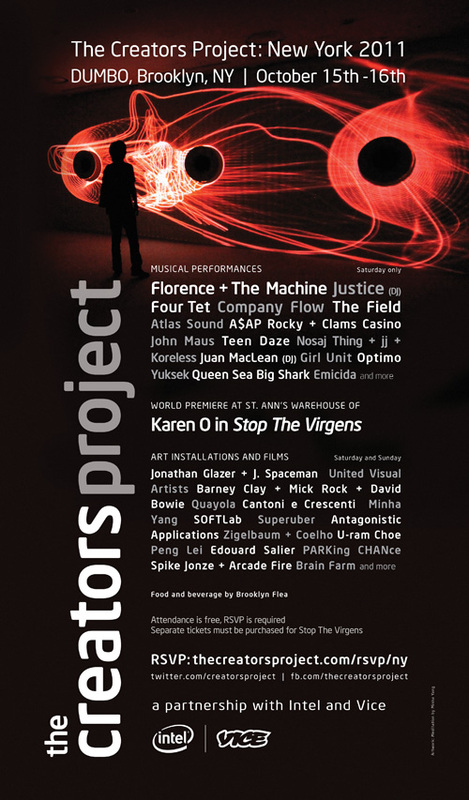 We LOVE the The Creators Project, a collaborative creative collective (ambigious, but it really is just a whole bunch of cool creative stuff) done in partnership with Intel and Vice is hitting Dumbo this weekend. Intel & Vice...in partnership? Who would've thought...although once you go digging around on their site it really is quite a brilliant match. Attendees this weekend will experience some interesting art installations (many involving some pretty exciting sounding technology implementations) and a gangload of music including the perpetually hip Florence & the Machine and Justice. They're dedicated to the "celebration of creativity, culture and technology" and since we are too, we'll be there. You should RSVP and join too.